- Create a faux-floor rug with strategically placed tiles for an Art Deco design. 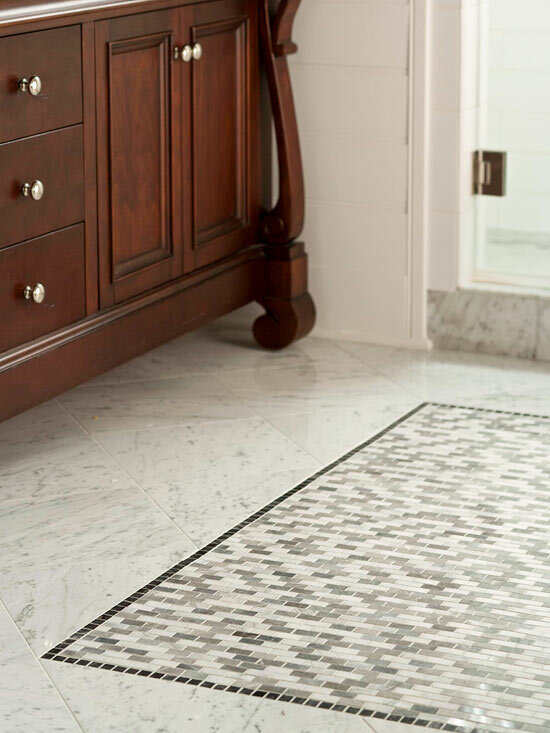 Create a pattern in front of your vanity cabinets by using small, colorful tiles to design the rug. If you can afford it, add an in-floor heating system under the "rug" so you don't have to cover it up with an actual cloth rug to keep your feet warm while you're getting ready. 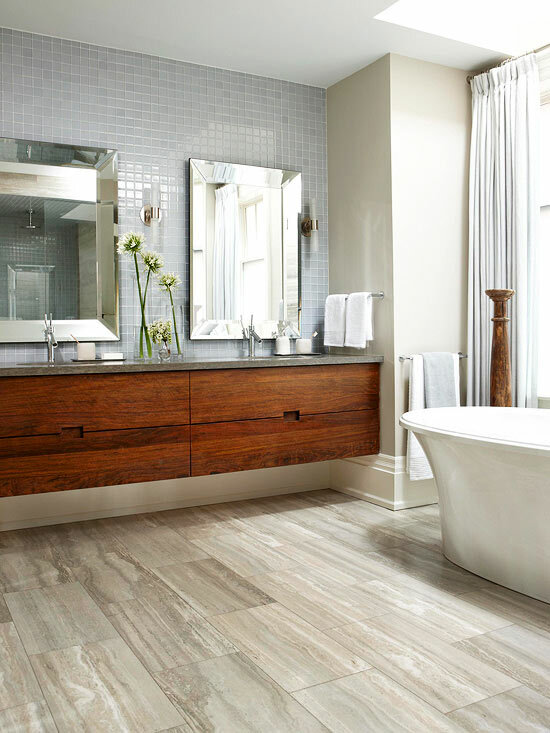 Enhance your bathroom design with a pebble tile floor or river rock stone mat to create the ultimate spa oasis. 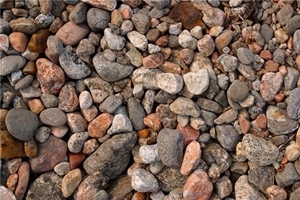 - If you're trying to create the ultimate spa oasis, pebble tiles are a must-have. This particular type of flooring massages your feet when you walk on it, adding an extra dose of pampering every time you're in the room. The stones offer a unique texture to the overall bathroom design. To tie the rest of the remodel together, consider using marble tiles in the shower and a marble countertop on your vanity cabinets in a shade similar to the stones. If you can't afford to install an entire floor of pebble tiles, update your bathroom with a stone rug for a similar look on a budget! 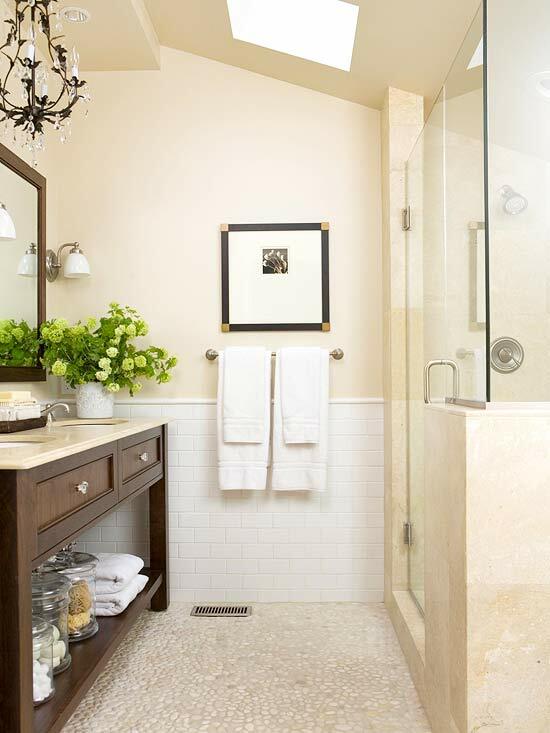 - Have fun with your bathroom design by pairing contrasting finishes. A cool travertine floor in grey is anything but boring in an otherwise neutral bathroom when paired with a warm, frameless wood vanity cabinet design. Use a tiled backsplash and countertop to tie the elements together. BARNWOOD GREY CABINETRY: STUNNING AND VERSATILE!